In our previous articles in this series, we covered what Docker is, and then how to manually build Docker containers for WordPress. In this article I’ll show you how to set up Docker in a much easier way. Docker has an official image for WordPress that makes it easier to get started. We’ll also check out Docker Compose for a Heroku-like configuration. After all, building and managing containers manually can take a lot of work. Before we get started, make sure you create a new folder and navigate inside that folder. In my previous article we built a MySQL container. The official WordPress image (by the Docker team) requires you to have a running MySQL container. Next, search for ‘WordPress’ on Docker Hub and pull that image. Then, build a container from it. We see two environment variables. WORDPRESS_DB_PASSWORD is the database password for our user. But we haven’t yet specified this. Don’t worry though, this image will use default values for environment variables that we haven’t specified (when the container is first created). For example, WORDPRESS_DB_USER will be root if we don’t define it. The same applies to the database name with wordpress as the default. Check out the official documentation for additional environment variables. -d makes the container to run in the background. We can’t see the IP address of the container, to get this execute docker inspect wordpress to get its IP and port. Mine is 172.17.0.10 and the port is 80. Using docker inspect, you can find lots of useful information about a container. The problem with this example is that we can’t access the WordPress files, also each time we start the container, it will change it’s IP. But we can easily fix both of these issues. This is a very long command, we see two new arguments here. The -p and -v arguments. The -p argument is used for port mapping. Inside the container, Apache runs on port 80. We tell Docker that we’ll use the port 8080 to communicate with the port 80 inside the container. Also, we specified 127.0.0.2 as the IP for this container. -v "$PWD/":/var/www/html will map the two folders. By default, the container puts the WordPress files in the /var/www/html directory which is the filesystem inside the container (this is nothing to do with our local filesystem). Check out your current directory and you’ll see that some additional files are there. Using your new container, you’ll now be able to modify files in our filesystem. In the previous example, it was much more work to be able to write to our filesystem. This method is a lot simpler. But can it be more simpler? Sure it can! Until now, we’ve seen how to create our containers using commands on the terminal. As much as I love Linux and the terminal, I really don’t want to create the containers using the command line and remembering the various arguments all the time. That’s why Docker Compose exists. This tool started under the name Fig (not by the Docker team) as an Open Source, easier solution to manage multiple containers. Now the tool is officially maintained by Docker (under the name Docker Compose). Before moving to Compose, make sure to first install it. 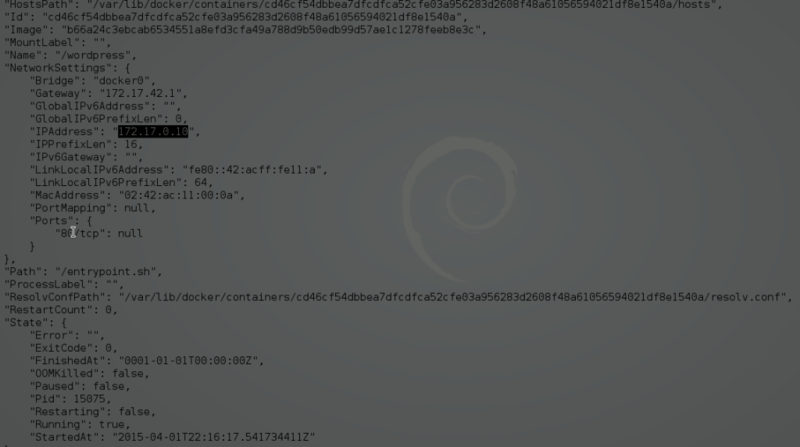 All you need is a docker-compose.yml file and a new project folder. In this file we’ll write all the configuration that is needed to build the wordpress and mysql container. Docker Compose, just like Docker CLI, uses the Docker daemon to create the containers, so basically you can do almost everything that you did with the CLI. This should be familiar to most readers. web and mysql are the names of the containers. When these containers are built from Compose, the actual names are different. A container created from Compose has a name like [foldername]compose_[containername]_[number]. The [foldername] would be the parent folder of docker-compose.yml, [containername] would be web or mysql in this case and [number] would be the number of the container. The good thing about Compose is that you can have more than one container of one type. We could have two web containers. Their names in this case would be [foldername]compose_web_1 and [foldername]compose_web_2. This also applies to other containers that are defined in docker-compose.yml (the mysql container for example). When using containers of one type, you’ll need to specify separate IP addresses. This works like -e WORDPRESS_DB_PASSWORD=password. This works like --link mysql:mysql. This works just like -p 127.0.0.3:8080:80. To learn more about Docker Compose commands and docker-compose.yml, you’ll find the CLI reference here and docker-compose.yml reference here. Now that you’ve got your docker-compose.yml file, execute docker-compose up and Compose will start building the containers for you. Navigate to 127.0.0.3:8080 and you’ll again see a welcome page. Now, all we need is access to the WordPress files. The working_dir tells the WordPress image to install WordPress in that directory. volumes: behaves like -v "$PWD/wordpress":/var/www/html/wp-content. The WordPress files live under /var/www/html folder. We’re really only interested in the wp-content folder, since that’s where our plugins and themes reside. After all, most developers only deal with this folder. You’ll now have write access to these folders and you’ll be good to go! This series wouldn’t be complete without showing you how to deploy a WordPress project. In the next article, I’ll show you how to deploy a Docker-based WordPress project on DigitalOcean. Stay tuned! If you’ve been reading the series this far, you should now have a much better understanding of the underlying concepts of how Docker works. You should now be able to work with abstractions and tools that make things even easier. If you have any questions please leave a comment below. I know that it’s the third time I’m asking, but I’m very interested if would you consider using Docker in production for your next project? $ VBoxManage modifyvm "boot2docker-vm" --natpf1 "guestnginx,tcp,,80,,80"
$ boot2docker ip gives you the address of your machine for me I goto http://192.168.59.103 in my browser. I got stuck on this for quite awhile. The section "Use the host-only interface (preferred)" at vbox-portforward by jonseymour cleared it up for me. Thanks for this very clear & detailed tutorial. Did you also get the following error after running docker-compose up? i started by following the official quickstart guide for wordpress/docker-composer but was confronted by the inability to add plugins/themes. and no clear explanation as to why. your series of guide cleared (and clarified) this hurdle. but i can't find the php.ini file i need change.